TANZANIA IS SET TO BECOME AFRICA’S LEADING PRODUCER AND EXPORTER OF RICE BY THE YEAR 2018. 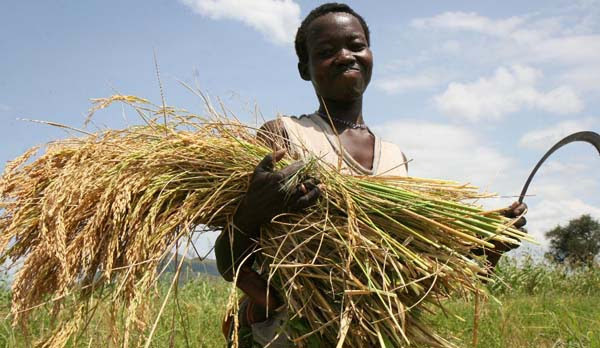 In five years time, our country will be leading grower of rice on the continent because the target now is to overtake Madagascar, currently topping Africa’s paddy farming bill,” said Mr Firmin Mizambwa the Chief Executive Officer for the Morogorobased Agriculture Seed Agency. According to the ASA executive, Tanzania produces over one million tonnes of rice per annum and is second only to Madagascar which leads with an astounding 4.3 tonnes of yearly rice production. “But Madagascar, being an Island, cannot expand its paddy farms while our country still has ample virgin land on which more estates can be established,” pointed out Mr Mizambwa, adding that Tanzania at the moment, tops the entire East African Region in rice production. The development comes just as the KATRIN Research Centre of Morogoro has launched recently developed two new varieties of rice seeds known as “Komboka,” and “Tai” said to be drought and disease resistant, recording fast-ripening bumper harvest in addition to being more tasty. The new rice varieties were launched in Arusha over the weekend, alongside 22 other new hybrid crop seeds varieties that local seed breeders have managed to develop The Permanent Secretary in the Ministry of Agriculture, Food and Cooperatives, Dr Mohamed Muya, said most of the seeds have been developed to cope with effects of changing climatic patterns. The PS said that the National Seed Committee has also approved the use of the 22 different new cereal and legume seeds in the country. The newly developed crop seeds included eight seed varieties of maize, one seed variety of sorghum, three seed varieties of beans, two seed varieties of cow peas, four seed varieties of Irish potatoes, three seed varieties of rice, and two seed varieties of barley. “The endorsement of those seed varieties follows recommendations made by the National Variety Release Committee, sat between February 13 and 14, this year in Arusha. It was approved meeting the required criteria,” the PS said, adding: “Apart from being productive, the developed seeds have also proved to be drought and disease resistant. They also reach early maturity, something which is good in the current situation when rains are unpredictable.” The seed varieties have been developed by public in collaboration with private research centres of Uyole (Mbeya), Ilonga (Kilosa), KATRIN (Ifakara), HORTITengeru (Arusha) and private companies of Aminata Quality Seeds and Consultancy Limited, Tanzania Breweries Limited, Panar Seeds (T) Company, Namburi Seed Company, East African Seed (T) and Bajuta International (T) Limited. “Mass production of the approved varieties of seeds is to start very soon by the Agricultural Seeds Agency (ASA). Our target is to ensure that those seeds reach farmers in the farming season of 2014/2015,” the PS said. According to Dr Muya, the new technology is meant to enhance food security by developing, through conventional breeding and biotechnology tools, drought resistant maize varieties for deployment to small scale farmers on royalty-free basis.